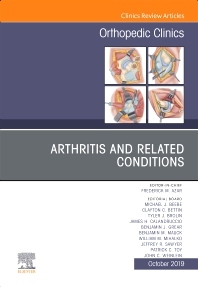 This volume of Orthopedic Clinics will focus on Arthritis and Related Conditions. Edited by members of a distinguished editorial board from the Campbell Clinic, each issue features articles from the key subspecialty areas of knee and hip, hand and wrist, shoulder and elbow, foot and ankle, pediatrics, and trauma. Topics discussed in the issue will include, but are not limited to: Septic Arthritis in Children, JRA in pediatrics, Post-Traumatic Osteoarthritis after Ankle Fracture, Outcomes of Current Ankle Joint Replacements, The Current Status of Cell Based Therapies, OA Alternative ROM Treatment, and Management of the B2 Glenoid in Glenohumeral Osteoarthritis, among others.